It’s not too late to make your mincemeat for Christmas but do it as soon as possible in order for the flavor to mature. 36oz of dried fruit (I used raisins, sultanas, chopped prunes and some dried cranberries). Zest and juice of 2 oranges and 2 lemons. 2oz chopped almonds or nut of your choice. 1lb Apples peeled and chopped. 1/4 tsp fresh nutmeg grated. Mix all the ingredients together except for the Brandy, cover and leave overnight, as this allows the fruit to plump up and absorb all those flavors. Transfer mix to a pan and cook on a very low heat for 30 minutes. Let the mix cool down and stir in the Brandy. Put into sterilized jars and store in a cool, dark larder or in my case the fridge or else it ferments. When I am ready to make my pies I either use all shortcrust pastry, lattice the tops which are very pretty or add a flaky pastry top as pictured. 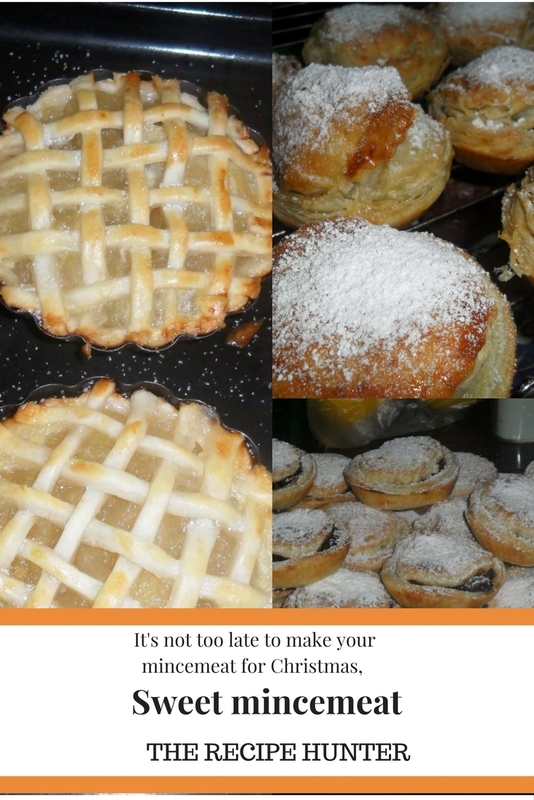 It’s that time, well a tad late but been busy so Sweet mincemeat it is, Who doesn’t love a hot Mince pie?